Nicholas Sorensen is a principal researcher at AIR, and director of the technology for teaching and learning practice area. His research is primarily focused on dropout prevention and helping struggling students succeed across the transition to high school. His work emphasizes the role of social psychological “mindset” interventions, strategies to support success in algebra and mathematics, and use of early warning systems to systematically identify, support and monitor at-risk students. Dr. Sorensen’s research uses improvement science approaches and experimental and quasi-experimental methods to develop and test preventive interventions. His work has been funded by the U.S. Department of Education’s Institutes of Educational Sciences (IES), Office of Innovation and Improvement (OII), Office of Elementary and Secondary Education (OESE), as well as private foundations, and is published in referred journals, technical reports and policy briefs. 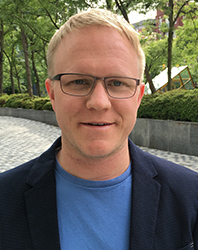 He currently serves as principal investigator on two IES-funded projects including one Exploration study examining short- and longer-term outcomes for students who take eighth-grade algebra with different levels of readiness and one Development and Innovation project focused on developing and testing a scalable and sustainable model of the Pathways to Success intervention in Chicago Public Schools. This “mindset” intervention is designed to help students link future goals to current effort in school and improve self-regulation, attendance, and academic performance. Dr. Sorensen also serves as principal investigator for the evaluation component of an OII-funded Skills for Success project in collaboration with Chicago Public Schools focused on developing and refining a multi-tiered system of support to improve social and emotional learning in middle grades. Dr. Sorensen also co-directs two studies including an IES-funded cluster-randomized trial examining the impact of an early warning system conducted for the Regional Educational Laboratory-Midwest, and the OESE-funded Promoting Student Success in Algebra I project, which provides practitioners and policymakers with evidence on how to improve algebra achievement for struggling students. He has served as a lead analyst for multiple randomized controlled trials including an IES-funded efficacy trial examining the impact of online credit recovery in Algebra I for at-risk ninth graders in Chicago Public Schools and an IES-funded efficacy trial of online Algebra I for rural eighth-grade students conducted for the Regional Educational Laboratory-Northeast. Prior to working at AIR, Dr. Sorensen conducted rigorous research on the educational benefits of diversity in higher education, including a collaborative nine-university randomized controlled trial assessing the efficacy of intergroup dialogue.